The Royal Academy of Arts has opened its new campus to the public to reveal the spaces transformed by architect Sir David Chipperfield CBE RA. In its 250th year, the new Royal Academy, with support from the National Lottery, is able to open up more of its collection to the public and offer a series of free displays on art and architecture across the campus. Facilitating this is the new link between Burlington House and Burlington Gardens, joining the RA’s previously fragmented campus to provide 70 per cent more floor space, allowing for more galleries, interventions, exhibits and installations then ever possible before. The new RA will seek to explore its foundation and history alongside showcasing works by Royal Academicians and students at RA Schools. Inaugurating the new exhibition galleries is Tacita Dean: LANDSCAPE, supported by Art Fund. The Royal Academician’s drawings, film installations and found objects aim to broadly explore the genre of landscape. The RA has provided a new permanent home for architecture in the form of the Dorfman Senate Rooms. The architecture studio will provide a space to critically engage with innovative and creative ideas on architecture and where it meets the arts. The space opens with the show Invisible Landscapes, exploring digital technologies, the opportunities they afford and their impact the environment. 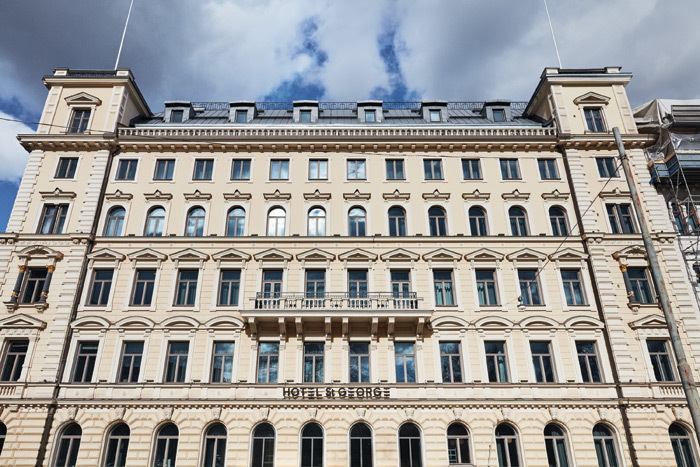 Design Hotels has opened Hotel St George in Helsinki. Housed in the city’s former Literature Society, the space has been reimagined by Design Hotels to include 148 rooms, five suites, wine room, poetry room, winter garden and wellness centre. The building was originally designed by Finnish architect Onni Tarjanne and has been restored with a curated selection of furniture and art to rival the city’s galleries. Most notable is the floating dragon of bamboo and white silk by Chinese artist Ai Weiwei, the only piece by the artist to be displayed in a public space. London Design Biennale has announced that the V&A, in collaboration with UK-based research agency Forensic Architecture, will curate the UK entry. The interdisciplinary team of filmmakers, software developers, archaeologists, lawyers, journalists and architects will explore the role of digital design in relation to cultural heritage documentation and preservation. In response to the theme of Emotional States, Forensic Architecture will be working in the Sinjar area of Iraq, training members of the Yazidi people in the documentation and preservation of evidence of destruction, genocide and enslavement committed by Daesh (Islamic State). Forensic Architecture will produce 3D models of sites destroyed by Daesh using historic imagery to provide evidence of the destruction caused. The installation will seek to examine how design can open up new lines of inquiry. The exhibition will tell the story of the research project, from collecting and reconstructing images, to the objects used to train Iraqi citizens, such as rigs made from kites, plastic bottles and helium balloons. It will also explore the way digital cultural preservation has been used in the past to provide communities with evidence of their trauma. 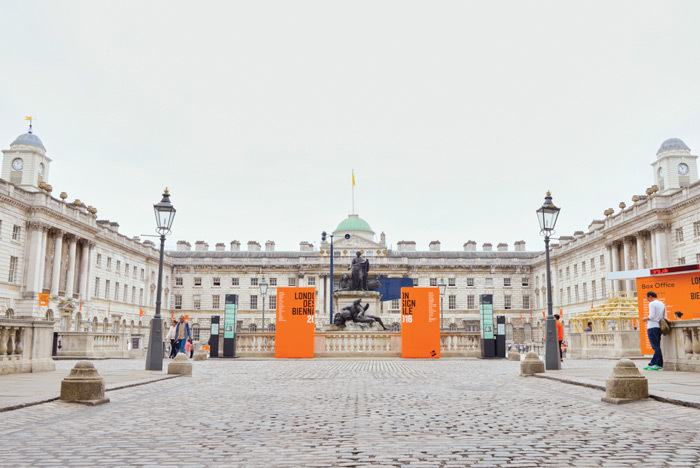 London Design Biennale takes place at Somerset House, 4-23 September. Mizzi Studio has been commissioned to design a series of kiosks in London’s Royal Parks. Jonathan Mizzi has designed a sympathetic timber structure; organic in aesthetic and materiality to mark the entrances to the Grade I listed parks. 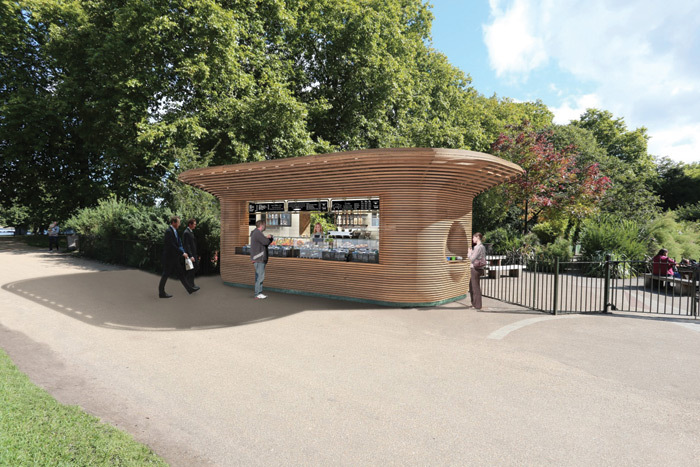 The kiosks will feature steam-bent timber cladding by artist and designer maker Tom Raffield. Each kiosk is rooted in the respective park’s location and heritage, with a feature kiosk in St James’s Park in the form of a brass horseshoe. The kiosks will host artisan brand Colicci and its range of speciality coffee, fresh food and ice cream. 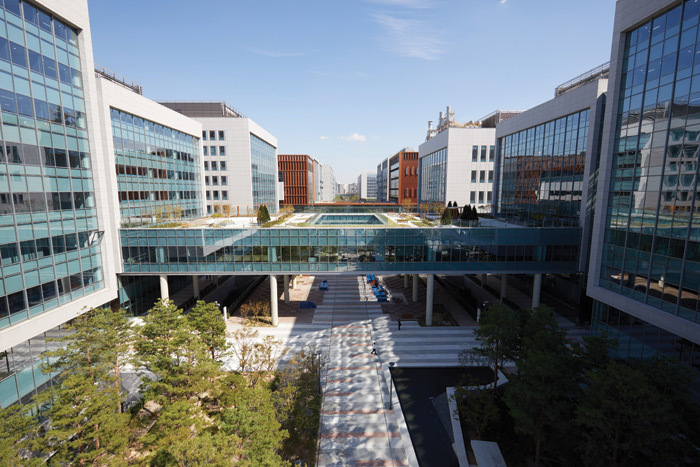 HOK has created a new home for collaboration and innovation as the LG Science Park opens in Seoul. As the research and development hub for global electronics brand LG Group, it will host scientists and staff from electronics, chemistry, nanotechnology, display, fabrication and life sciences. With HOK creating the masterplan and leading the design, Seoul-based firms Gansam Architects and Chang-jo Architects also contributed to the design work. The Science Park was designed by HOK’s Science and Technology practice, and showcases its commitment to encouraging collaboration and lateral thinking in the workplace. 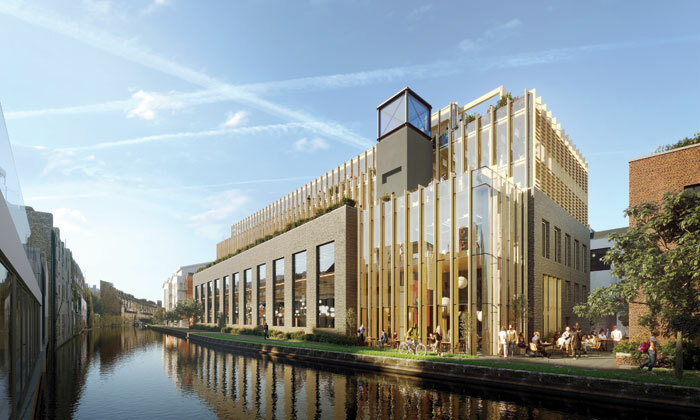 Studio RHE has been granted planning permission to transform a dilapidated former vinyl factory on the Grand Union Canal, restoring and extending it to five storeys of offices, studios, cafe and roof garden. The site will be given both a new look and a new purpose, with some 7,900 sq m of office and social space, estimated to create 1,000 jobs when fully occupied. The water- facing cafe will create a meeting space for the local community and reinvigorate the canal side environment. The exposed CLT timber structure is complemented by an understated material palette of grey-black brick work and anodised bronze cladding. Amanda Levete’s practice AL_A has been shortlisted, along with three other teams, to reimagine the visitor’s experience at the Eiffel Tower. In collaboration with GROSS.MAX and Professor Ricky Burdett, AL_A is embarking on a decade-long journey to rethink the ways people discover, approach and visit the Eiffel Tower and surrounding area. The project hopes to see the City of Paris achieve its ambitions to revise the use of the public space for the 20 million passers-by each year and provide cultural offerings in addition to the site’s rich history. WeWork has announced that it will be partnering with BIG founding partner, Bjarke Ingels to steer WeWork’s visions in creating innovative and relevant places to live and work in. Ingels will continue to lead BIG, but will now also be lending his thoughts and insights to WeWork, working to advance the spaces it is creating and looking forward to see how they can positively impact the neighbourhoods and cities that they are a part of. Chris Wilkinson RA has been appointed as the new Treasurer of the Royal Academy, replacing Chris Orr RA in the elected appointment for a three-year term. Having chaired the Client Committee since 2009, overseeing the redevelopment of 6 Burlington Gardens, Wilkinson will now formally represent Academicians on all financial matters. The news comes as the Royal Academy also announced the election of a new Royal Academician, two Honorary Royal Academicians and a new Professor for the Royal Academy Schools, following a recent general assembly. MET Studio’s exhibition, Special Forces: In The Shadows, has opened at the recently refurbished National Army Museum in London. The London, Hong Kong and Singapore-based design consultancy has used the exhibition to explore ideas of secrecy, looking at the operations and processes at play within the UK Special Forces and the public perception of such. Central to the exhibition is a large two-way mirror box. Those inside the mirror box can see out, but others cannot see in, acting as a metaphor for the role that the UK Special Forces plays in our lives with its undercover surveillance. Subtle interventions such as this offer another layer of complexity on the theme of secrecy. Neil Tomlinson Architects have been involved with the New Covent Garden Market scheme since the original masterplan in 2011. Among the redevelopment of Battersea Power Station, the Northern Line extension and the completion of the American Embassy, Neil Tomlinson Architects has now been commissioned to refurbish railway arch spaces on the site over the next eight years. The development will be phased, beginning with the installation of new services and investigating potential pedestrian links through the arches to improve accessibility to the new Nine Elms Tube station. Four arches a year will be fitted-out for ongoing market use. The second phase will look to fit out the most easterly arches, with food and retail offerings in anticipation of increased footfall from the new Tube link. Ralph Courtenay had been appointed as design director at Centrium. Having led teams at HOK, AEDAS, Rafael Viñoly and Jump Studios, Courtenay brings with him a wealth of experience in workplace design and consultancy. Managing director, Toby Hill, says Courtenay’s appointment ‘will prove invaluable as we continue to deliver new and innovative furniture solutions to our clients’. Talan Tower, the 12,500 sq m commercial workplace and home to the headquarters of Astana Properties in Astana, Kazakhstan has been given an elegant, flexible and sustainable lighting scheme by fdcreative. Working closely with lead designers Perkins + Will, it was briefed to design the lighting for the main reception area, lift lobbies and the top two executive floors. The lighting scheme has brought vibrancy to the welcome area with a bespoke LED backlit ceiling, with controls to adapt the warmth of the light. The Furniture Makers’ Company has announced the first designs to be awarded the Design Guild Mark in its new 2D category. The Mark has been recognising excellence in the design of furniture for volume production since 2008, and has introduced a new category for fabrics, textiles, wall coverings, floor coverings and carpets this year. Judged by industry experts, the Mark was this year awarded to: Silicastone, designed by Alasdair Bremner and David Binns for Alusid; Jitterbug from the Shoreditch Range, designed by Gary Bridge for Axminster Carpets; and The Alchemy Collection, designed by Rachel Evison for Bute Fabrics. Venetian glass artist Massimo Micheluzzi will be brinng his new Architectonic Glass collection to the Willer Gallery in London from 20 June to 14 September. Micheluzzi is renowned for his use of traditional Venetian glass-making techniques in powerful and inventive ways. The new collection uses architectural forms to appear solid and robust, in contrast to the fragile nature of the material itself. Architectonic Glass presents a departure for Micheluzzi in form and method, displaying the result of his exploration of the material.